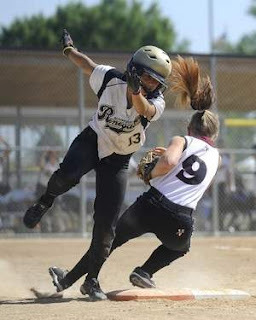 Having just returned from the ASA 14u National Championship tournament in Sioux Falls, South Dakota I thought I would take this opportunity to share some random thoughts and reflections from my week at Nationals. 1. I came away from the week extremely impressed with so many players and teams from places I did not expect to be impressed by! 2. The people of Sioux Falls are some of the nicest, most genuine people I have ever met. 3. The organizers of the tournament did an incredible job running the tournament! 4. I saw a lot of burned out corn fields on my drive from Omaha to Sioux Falls and back. It was a tragic and surreal scene. 5. As a softball coach or softball fan you couldn't be happier than to see so many girls and teams so enthusiastic about playing the sport they loved, and having the opportunity to play on the biggest stage in their young careers! 6. Umpiring can be bad outside of southern California too! 7. The bigger the stage the greater the pressure. For a lot of these girls, my team included, it was the first time they had college scouts watching them play. 8. One night all nine games got suspended due to weather and several teams, with the help of a boom box on the back of a pickup, found themselves dancing in the rain in the parking lot at 10pm. These are the memories I think are the coolest! 9. Lots of bad parent behavior, unfortunately. I guess when you pay more for the trip you have the right to yell at players and coaches more. 10. It was great having the opportunity to meet several college coaches and have conformation from ALL of them of the vital importance mental skills mastery plays into being recruited and achieving college success. 11. Traveling today is a royal pain. My trip to South Dakota took 17 hours, and my trip home took 20 hours. No, I did not drive...I flew American (last time). I now know every nook and cranny of both the Dallas/Ft.Worth and Omaha airports! I did meet some interesting people though. 12. Nothing was cooler for me all week than watching the full moon set over the cornfields of Iowa at 3am on my drive up to Sioux Falls; the incredible array of stars in the South Dakota sky; or the solemn moments before an 8am game (of course I was at the field at 6) watching the sun rise while the grounds crew watered the diamond. Enjoy your brief softball respite before we all crank things back up in a few weeks!